This morning our house church had a “surprise” birthday party for me (one day early). I sort of figured it out when it was our turn to host house church but they changed the venue without a reason. But it was still so touching as we walked in and one of the junior high girls put a homemade lei on me, and then one of the women pulled out a beautiful fruit birthday cake that she had made, and everyone joined in to sing Happy Birthday. I really felt loved. This was all really special. But there was something that made the celebration absolutely unforgettable. Today, during worship, our Japanese friend “George” prayed to enter the Christian life (read more about George in posts Learning and Loving and Transformers)! We had broken up into small groups to discuss the Bible passage for the morning. Eric was teaching the kids in another room, two women’s groups, and then George and two Christian men from the group were meeting together. Suddenly Hiroshi announced what had happened…There was such a sense of peace in George’s heart and joy across his face. We all shouted and cried and rejoiced together. I read John 3:3-7 to George and the group… Jesus tells Nicodemus that he needs to be born again- its not enough to be born once. Today we celebrated my original birth into the world. That was nice. But there was such an amazing sense of rejoicing as we celebrated George’s re-birth, entering into the eternal Kingdom of God (Below: Aiko and Olivia, rejoicing). George’s salvation is a wonderful reminder of the effectiveness of short-term mission teams. 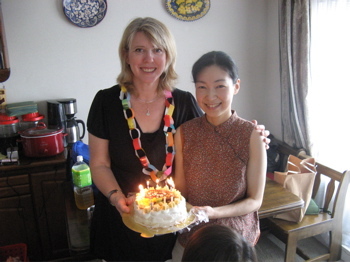 Last year, a mother-and daughter from our New Jersey team stayed with George and Aiko, and had a direct impact on Aiko’s becoming a Christian shortly after they left Japan. Last week, a father-and son team from California stayed with them, and really made a difference in George’s decision to follow Christ. Short-term teams: bring ’em on! Tonight we found out about some close Japanese friends who are questioning our motives and vocations as missionaries here in Japan. It felt painful. And yet we are reminded that there will be opposition when God is at work. And He is –tonight, in a suburban home in Sanda, Japan, there is a new Christian couple praying together and putting God first. This is worth celebrating. Happy, happy birthday, George. Can you give me video suggestions? I am several days late reading emails, but this one brought tears to my eyes. How beautiful it is to know that all over the world we are brought together by the love of God! It is especially powerful for us (Jong being Korean) to know that we have brothers and sisters in the Lord who are Japanese! As always I love to see the photos of your adorable children, particularly the way that Eric loves on them. I long for the day when Jong will embrace that role, and we can have the opportunity to adopt a baby. Eric, you are a true demonstration of the father heart of God. Bless you. Bless you. Bless you. I’d love to write you an email,can you tell me your email address?